I love crystals. I have been enjoying them, working with them, carrying them, giving them for many years. And while many of the beautiful crystals can be clear, it is often the ones that hold inclusions, clouds, shadows, phantoms, figures, faces, occlusions and a variety of designs that are even more beautiful. And it is this embedded complex structure that can hold great meaning for us. Think of the crystallized belief as a crystal from the Earth. Crystals have a consciousness that has been created over millions of years. Humans have not been on the planet that long. What information might be stored in that crystal for you? The “consciousness” of crystals is what we need to mine. Yes, first we have to discover them in the Earth, un-Earth them. Then we have to discover their meaning for us, the messages they bring. Now look at the crystals within you for the messages that they hold for you. What does stuck energy want you to know so that you can move forward and let the energy flow again? Here’s the deal: the Earth’s crystals can help us break free of the crystallized beliefs we carry – when we are ready. This is the true “healing potential” of these crystals. The perfect example is people who either do or do not believe in crystals. First, the crystals are real, they exist just as any other form of matter exists. So, I believe in the existence of crystals. Second, they hold information; their very structure, often extraordinarily complex, is information. Third, we can read and interpret that information, use its meaning in insightful and intuitive ways. OK, this third point may be touching on a belief. Fourth, using the interpreted information to clear blocks, clear or modify the internal crystalline structures we want to release, is clearly a belief. And so are those blocks, holding us back from fulfilling our true purpose, beliefs. Clearing those blocks means adopting new beliefs, e.g. 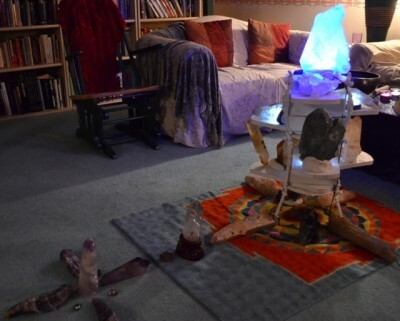 the belief that crystals can be effective in the healing process. I have been working with a specific set of crystals for over a week now. (Pictured here) And I find myself opening up and flowing more than I ever have. I attended a “crystal meditation” the other evening with an array of crystals, crystal and Tibetan singing bowls and meditative sounds. I went into a deep and long “bliss state” as never before. Not only are crystals helping me clear stuck beliefs, they are helping me understand the deeper nature of reality. Everything you need to know is available. You just need to know where to look and how to interpret what you find. Start with what you know are energy blocks. And be ready for the energy leap of personal growth to follow the crystal clarity! PS: Are you looking for “crystal clarity”? Guidance is available from many dimensions. Rosemary is continuing a series of teaching and channeling experiences for everyone! If you have spiritual questions, if you want to hear messages from other dimensions, if you are curious about life beyond this physical, three-dimensional world, if you are curious about the energies of 2014, join us for a unique experience! Come with your questions; this opportunity is interactive. Rosemary will teach and channel for part of the time and answer your questions at the end of the evening. Join us online or in person; check out the details here.